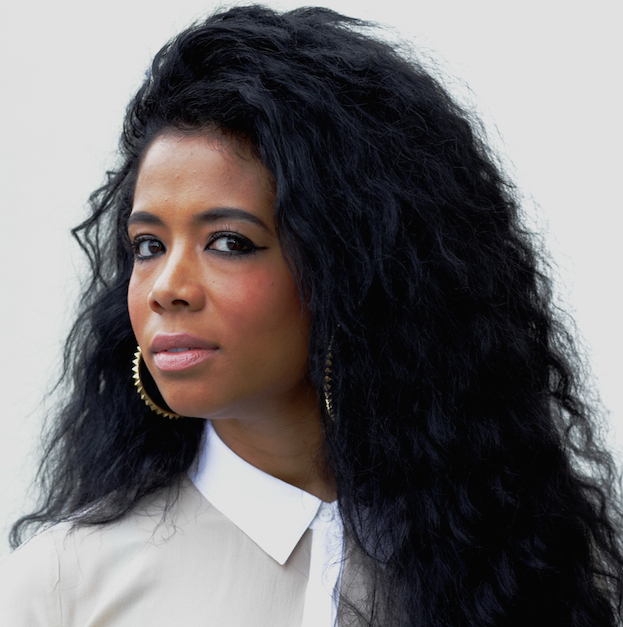 Louise Brailey talks to the enduring and outspoken R&B star Kelis about the central role food plays in her life, the importance of family and why people who ask her advice on being an artist really shouldn’t bother. Kelis Rogers has been an enduring, uncompromising star in the R&B firmament since 1999’s rage-fueled “Caught Out There“. Oh sure, she’s had hits, massive ones actually—”Milkshake” from her Neptunes-produced third album Tasty is a modern and much-played classic—but selling shedloads of units never seemed Kelis’ style. When she relaunched herself, post-very public break-up, as a steely Eurodance diva singing about motherhood over arena-sized David Guetta-produced choruses for 2010’s Flesh Tone, many critics balked—and the album tanked. A few months and a handful of EDM thinkpieces later and the story could’ve been different, but by then she’d moved on. Now, in a musical age characterized by maximalism and groundbreaking production, she’s chosen to sign to independent label Ninja Tune and strip things right back: Food is a record steeped in nostalgia. It revisits the sounds of sixties soul tropes—updating them with Dave Sitek’s flashes of hip-hop production—and the memories of her Harlem upbringing they trigger as involuntarily as certain smells and tastes. If the food metaphor is obvious, the fact she studied at La Cordon Bleu may not be. Louise Brailey sat down with the artist at Berlin’s Soho House to talk about the central role that food—and by extension, family and style—plays in her life and why people who ask her advice on being an artist really, really leave a bad taste in her mouth. Watching your video for the first single “Jerk Ribs” off of your new album Food, I was pleasantly surprised to see that you’d resisted adopting a less adorned fashion sensibility to accompany the more stripped back sound of the album. The video shows you being preened and prepared; having your make-up applied while you look unbothered. I was wondering if it was somehow a critique show biz fakery or a celebration of a heightened femininity? I hadn’t really thought of it that way. I guess it would teeter more toward the celebration. It’s funny, I was on my Instagram a few months ago and all the people who follow me were like, “It’s ten years since the release of Tasty!” I was like, “Good God, that’s a really long time!” And Tasty was my third album! This is 15 years of doing this and I think that I come from a different era of the music business, a different era of music in general. I’m not a new generation artist and I have no desire to be. I own the decades and time that I’ve put in. And this is what it looks like. I mean, I’m never going to pare back the fashion. It’s something that I love, it’s part of my existence. What you put on and what you adorn yourself with, it’s a way to present yourself to people without speaking. It’s interesting that you mention your Instagram. You’ve wholeheartedly embraced that as a means of presentation, too. Well, here’s the funny thing: I’m not a social media person. It’s extremely narcissistic, but I do have a few issues. First thing, people are no longer able to be present in the here and now which is irritating to me. If you’re talking to someone and they’re on Instagram, it makes me want to throw the phone through the window. It also shows lack of attention span and almost a lack of intellect. Growing up, if I said “I’m bored” to my mom, she’d be like, “If you’re bored, you’re boring”. Second, even though I get why social media is great and I like the idea that there’s so much access, it gives me anxiety. I’m a bit of a control freak. I prefer to stay oblivious. Although I’m on Instagram I don’t follow anybody; although I’m on Twitter I don’t follow anybody. I hardly ever “hashtag”. I don’t even get that. I don’t like the fact that everyone feels the need to exalt their personal life. It gives me the creeps. You mentioned your mother, who was a fashion designer. Your dad was also a musician. Do you feel like the tone of the record, its references to a certain musical era and mood, was a way of exploring memories of growing up in New York City and Harlem specifically? I’m big on that feeling that you get when you listen to something and you think about how perfect it is, when it reminds you of that summer where that song was played every day. I never wanted to copy that or duplicate that, I wouldn’t even dare. It seems almost disrespectful. But I really wanted to capture its essence more than anything else. What role did food play in your family growing up? This album’s called Food of course, and it’s a reoccurring theme throughout. A huge role. Everything was done around food, and I think that’s another thing I love about it in general too. I love the idea that across the board, people gather around food. I always say that at every major event in someones life there’s always food and music. Whether it’s a graduation or a wedding or a birthday. I like the idea that it has such a huge part in our celebrations, of uniting with one another. For me growing up, my mom went to the Fashion Institute of Technology so she’s a very skilled pattern maker. She started a catering business and she cooked constantly. And of all the Michelin starred restaurants, all the amazing eateries that I’ve been too, my mom is still hands down one of the most versatile and skilled chefs that I know. We also couldn’t even leave the table without finishing. No. I have three sisters, two are a lot older so they were out of the house by the time I was aware of anything. My older sister was there for a bit but then she went off to school, so it was just me and my little sister. My mom is just very maternal in general, so there were always people in our house from the neighbourhood or people from church. Whatever it was there was always food, always. She’s Puerto Rican and Chinese and both of those are very feedy—they’re feeders, very aggressive about eating. So don’t go over and not eat. You have to eat. And now you’re doing your own show for the Food Network. Yes. And I have a range of sauces that I’ve started—my speciality is sauces. What is it about sauces that you like so much? First thing is that I hate dry stuff, so I always want sauce. I’m a consistent person in that respect, even just my personal style. I love accessories. When I think about anything, it’s all the extras. Anybody can wear a pair of jeans, but it’s about the extras—the hat, the jacket, all the little things. I think sauce is the epitome of that. It’s the extra, but it’s also the defining factor. I travel so much and when you think about what defines and connects something culturally, there are similarities in food. There’s a dumpling in every culture, but always in a different style. We’re here in Germany and we went out for dinner last night, and I love hot sauce, any kind of hot sauce but they’re not big on spice here. But you can get a mustard with a really serious kick. That for me is what differentiates eating sausage here, from eating sausage in Spain. It’s just these little tiny tweaks that signify who we are. How do you apply that to your music? I’ll be honest with you: I’m not as calculated with music as I am with food. I’m not interested in being so precise. Music in general is more subjective, or based on the listener, whereas with food there’s a right and a wrong answer. I can’t really take credit for why I’m the way I am in music—it’s just the way that I’m made. I think it’s a little bit ahead of how everything is happening today, but I don’t know why because I’m not that aware of what’s happening. You don’t follow new music? Well I don’t follow current events at all. I’m completely lost. I hate to sound like the Grinch who stole music but I feel hypocritical in a lot of senses. I had this moment a few years ago when I was super stressed out and I asked myself why I was doing this. I think it was because I was going through a dry spell. I wasn’t writing and I was feeling inadequate in general, as artists do sometimes. At the time, one of the things that kept resonating in my mind was why would I even attempt to be as good as the things that made me love music? It seems pretentious and arrogant in a way to believe that I could match these great people who made such magnificent moments in life. So I guess I don’t listen to a lot of new stuff because a lot of it’s not interesting to me, it’s watered down version of things that were better. I listen to music, I just don’t listen to a lot of new stuff. Usually what ends up happening is someone who knows me very well will be like “You should listen to this, you’ll love it”. I have a very small group of people who know me and who know how anti-everything I am. I think a lot of times people hear me say that and they think, somehow I think I’m better than everybody, and I don’t. So you haven’t observed the new generation of young female artists who have, arguably, come up in your wake in terms of being outspoken and forthright in a way that you were ten years ago? People always ask me, “What would you tell a young artist?” First of all I would say don’t ask me. Because if there’s another option, take the other option! It’s a lot less painful. I think people emulate artists too much. For me, when I started off it was the nineties and I didn’t have an idea of how people would perceive it, I wasn’t trying to make such grand statement. I was just talking, and it just so happened that I had a platform. I think people put too much emphasis on how this affects the world, and women in particular. It should be listened to and enjoyed. I think people put so much emphasis on artists, people start to emulate these people. They’re just people. Who gives a crap? I’m not more worthy than anyone else. The reality is too that there’s more trash than there is good. I’m not enthralled at the idea that women have decided to speak. I’m like, “Congratulations”. But it’s still seen as such a negative thing for a young woman to be angry or to have rage—especially a black woman. So surely it is important.